How the Auto Dialer works? Designed for direct, immediate phone, cell or pager notification in emergency situations using any regular telephone line. Using 2 channels, it will deliver customized recorded messages to 4 telephones, cellular phones and /or numeric codes to pagers. Question- thinking about getting home or business alarm Monitoring ? Our most requested Voice Auto-Dialers. is an exciting advanced telecommunications reporting system. Activated by almost any type of sensor or alarm voltage trigger, auto dialers will instantly deliverer your pre-recorded voice message or alert to any phone, pager or cell phone in any language, locally or to any number in the world. Interfaces with any alarm panel or can be used in a stand alone operation. Note: NOTE: this product is not for telemarketing purposes. Different optional sensors will trip the normally open/ normally closed dry contact on your dialer to start it calling the pre-programmed phone numbers (4 to 8) depending on which dialer model you have. your home has been entered by an intruder , etc. Plus you can call and deactivate the dialer, or listen in or even talk with someone at the location where the dialer has activated . HOW LONG DOES IT TAKE A MONITORING SERVICE TO RESPOND to your emergency ? The Solution to not having to PAY for a Monitoring HOME ALARM SERVICE !! The Auto Dialer WILL BE THERE. EEPROM Memory retains programming phone numbers and voice messages in the event of a power failure. Remote Turn Off by pushing 1## allows termination of activated call. Built in Line Seizure Relay- so it doesn't make a difference if some one leaves the phone off hook accidentally. Ideal for stand alone applications. Heat, break-ins, etc. 4 Separate voice message alarm zones Calls up to 8 telephones, cell phones or pagers. Remote Turn Off feature allows termination of activated channel. EEPROM Memory retains program despite power loss. Built-In Auxiliary Output to drive external siren, strobe or relay. 2 Separate voice message alarm zones Calls up to 4 telephones, cell phones or pagers. external siren, strobe or relay. AVD45-24 now has the “C” Feature of Extended Message Duration. Programmable Pauses Momentary /Continuous, NC, NO or positive voltage activation. Memory Retention (EEPROM) if power is removed or temporarily interrupted. Universal Dial Tone. Works with any analog phone system. Dialer calls 4 telephones, cell phones, or pagers. Five (5) optional settings for when notifications of a power loss occurs: Instantaneous, 15 minutes, 2 hours, 12 hours, or 24 hours. Dialer Senses loss of power and based on setting, will notify parties of loss condition only when specified time has elapsed. If power restores before set time has elapsed no call will be made. Package includes transformer and 9 volt battery connection. Includes Power transformer with MC-2a charge card. The cellular alarm panel, the SPCVD-2000 (Cellular Voice Dialer). 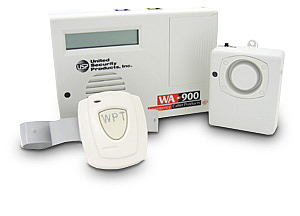 Call for Pricing The unit can be used in parallel with an existing alarm panel. When phone lines are cut, the Cell Voice Dialer remains operative. It can also be used as a primary alarm panel where no phone lines exist. Great for monitoring boats, where no phone line exists.. All you need is cellular phone service in the area. Works with a Motorola cell phone not included. AVD-45b now has the “C” Feature of Extended Message Duration. Momentary/Continuous, NC, NO or positive voltage activation. Optional use of 24 hr. rechargeable standby battery available or use of 9V battery. Dialer calls up to 8 telephones, cell phones, or pagers. One channel for power loss sensing, three hardwired channels for additional input. Package includes battery backup and transformer. One channel for power loss sensing,, one hardwired channel for additional input. Dialer calls up to 4 (2EC Model) or 8 (4EC Model) telephones, cell phones, or pagers. If power restores after set time has elapsed, the dialer will begin calling for notification of power restoration. PFR-4EC Model has two additional hard-wired alarm zones. 2 voice message alarm zones. Calls up to 4 telephones, pagers, or cell phones. Automatically redials busy or unanswered numbers. In the event of a power failure the battery pack will immediately activate and keep the dialer functioning. WORKS AUTOMATICALLY! Detects the person wandering away and then sounds the alarm and calls for help! The wireless pendant is attached to the patient with a non-removable band and sends a continuous signal to the Wanderer Alert unit every 10 seconds. When the patient attempts to wander away, the WandereWA-900r Alert unit detects the missing signals and sounds the horn/strobe alarm and/or dials the telephone, cell or pager numbers that you have installed and leaves your message in any language. A switch on unit allows you to select dial out. The Wanderer Alert is capable of monitoring both High risk and Low risk patients.